It’s like a pancake, but scalliony. In my experience, I’ve learned that some of the best food in the world can be found on the street. No, not literally on the street (although the 10 second rule certainly applies for some of this food), but food that is sold on the street rather than from some brick and mortar building. 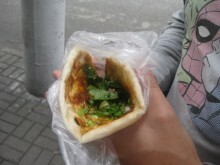 A major part of the allure is the tracking down of the street food. There’s no address, so you really just have to stumble upon it. Plus, since it’s mobile and there are no hours, there’s no guarantee the food will be there again the next time you look for it. The biggest part of the allure, though, is the taste. It takes someone with an iron will to seek out this kind of food, but when you find something great, the payoff is huge. 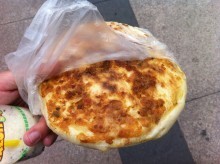 Some of the best breakfast street food can be found in the form of bing (Chinese flatbread). Little carts and literal hole-in-the-wall places can be found all over Shanghai hawking bing in the mornings. Bing has a wide range of thickness, circumference, add-ons and more. Fortunately, just outside of our hotel (Manhattan Business Hotel) in the Huangpu District of Shanghai, we found ourselves a bing cart in an alley. This cart cooked up cong you bing (pronounced tsong yo bing), also known as a scallion pancake for only 3 rmb each. This cart even had a twist on the typical cong you bing by frying an egg on it. Cooking the bing begins when a lump of dough is tossed on the portable griddle with a generous amount of oil. The cook then flattens out the dough to the desired size with an iron, sprinkles some scallions and salt on the dough and cracks an egg onto the thing. But that’s not all. After the cooking is finished, you get to throw some toppings on. First and foremost is the thick, sweet brown sauce. I have no idea what it actually is, other than the fact that it’s thick, sweet and brown, but it goes great with the otherwise savory bing. Other toppings include some tiny pickled veggies, cilantro, a spicy chili sauce and then more scallions. Put it all together and you get one hell of a breakfast. Although the high dose of scallions and pickled somethings don’t fit in with my unvegan diet too well, I am certainly not a picky eater while traveling. After all, I would hate to miss out on something as tasty as this. Another variety of bing, this one found at People’s Square. Some even claim that this might have been the inspiration for pizza via Marco Polo, and although the history major in me tells me that’s wrong, it’s not hard to draw the comparison. While cong you bing makes a great breakfast, there are many varieties of bing to be found outside the major tourist areas of Shanghai. If you don’t mind the risk of getting lost in a big foreign city, you might just stumble upon some of the best breakfast street food the world has to offer. when eggs are added it’s called a jidan bing. You sure it’s not just cong you bing with jidan?